Are you looking for expedited Legalization Services from Senegal Embassy? DC apostille provides fast document Legalization from the embassy of Senegal in Washington DC for documents issued in the United States and destined for use in Senegal. 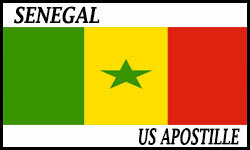 Senegal is not a member party to the Hague Apostille Convention and still requires Embassy certification in the United States to acknowledge the authenticity of foreign documents. DC apostille can legalize certain types of documents from the embassy of Senegal in Washington DC such as federal documents or public States documents. Please, pay attention to the requirements of your document to avoid any delays in the legalization process. Certificate required for the export of human and animal drugs, cosmetics, medical devices and personal care products that are not legally marketed in the United States. A Certificate required for the export of pharmaceutical products across the United States’ boundaries. CPP Certificate. Your document must be notarized by a notary public in the same state that issued the document before you can order our Senegal Embassy Legalization service. You must call us first to confirm your request. Amendment is an alteration to a legal contract to add, remove, or omit a certain term. The amended document must be signed by the same signatory parties to the original contract. US Corporations issue Certificate of Existence to prove their existence as an authorized corporation that is entitled to practice business and trade. Certificate of Existence sometime called Certificate of Good Standing, Certificate of Status, or Certificate of Authorization as it authorize the company to do business in a certain jurisdiction.